Double Olympic champion Helen Glover has announced she is expecting twins. 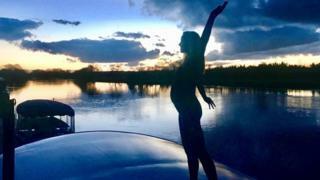 The Team GB rower, who is herself a twin, shared a photo of herself posing against a sunset with her baby bump showing. Glover, who is married to TV wildlife expert Steve Backshall, said the new arrivals would be "the biggest adventure" of the couple's lives. "It will be a big change but such an exciting one," said the gold medallist, who is due to give birth in July. "It's something we've wanted together for ages, and we are both really happy - Steve is absolutely beside himself." Glover made the announcement via Twitter. Backshall shared the same images on Twitter, and wrote: "On the boat with my three favourite people; seems this summer we'll have some little ones of our own." The pair, who married in September 2016, found out about the pregnancy before Christmas but had been away filming since then. Last March, Backshall told reporters he and Glover, who live in Buckinghamshire, were not quite ready for a family so soon after their wedding. The presenter told Radio Times magazine they were waiting "a few more months, possibly up to a year" before deciding whether to have children. She took part in a victory parade in her home town of Penzance after the win and a Royal Mail postbox was painted gold in the town in honour of her winning performance.